Alabama House passes new abortion restrictions, including “fetal heartbeat” ban. Pro-choice protests will continue, as more states try to regulate legal abortion out of existence. Alabama is on the verge of eradicating most legal abortion in its state. 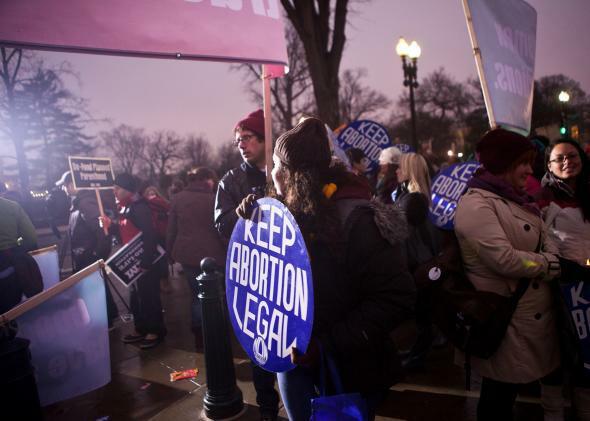 Tuesday evening, the state House of Representatives passed four major abortion restrictions. The most provocative and most likely to be shot down in the courts is the ban on all abortions as soon as a heartbeat is detectable, which not only necessitates a transvaginal ultrasound, but also means that abortion would be banned as early as six weeks. In case some women do have enough hustle to get that abortion in the couple of weeks between early pregnancy detection and the ability to find a heartbeat, the legislature bumped the waiting period up to 48 hours from 24 hours. The ostensible reason is so women can think it over, but at this point, it’s clear the real reason is to drag out the preparations for the abortion until the abortion is no longer legal. Abortion for teenagers will mostly be impossible. They will need a certified birth certificate and a notarized consent form, all paperwork that is too much hassle to get together in the brief window of opportunity to get an abortion. The debate over the bill was racially loaded, in no small part because its main advocate, Republican Rep. Mary Sue McClurkin, has an affection for invoking Brown v. Board of Education, the Supreme Court decision desegregating schools, when defending it. For instance, she told an ABC affiliate that she doesn’t worry about the court challenges to her various anti-abortion bills with this baffling quote: “I’m not really concerned about the challenges. We’ve had challenges before. We wouldn’t have some of the things we have now if it hadn’t been for Brown v. Board of Education.” It’s hard to parse, because presumably she wouldn’t want the courts overturning her anti-abortion laws the way the court overturned laws establishing segregated schools in 1954, and yet. The comparison of abortion restrictions to Brown may not make a lick of sense, but it is certainly provocative. Duly provoked by the racially loaded rhetoric, pro-choice Democrats got incredibly, understandably angry. “I am absolutely insulted as a black woman, as a member of the House of Representatives, that you as a white female would stand here in my face and say that this bill has something to do with the Brown v. Board of Education case from 1954,” said Rep. Juandalynn Givan. Democratic Rep. Alvin Holmes was less judicious. “Ninety-nine percent of the all of the white people in here are going to raise their hand that they are against abortion,” he said. “On the other hand, 99 percent of the whites who are sitting in here now, if their daughter got pregnant by a black man, they are going to make their daughter have an abortion.” It was an unfortunate rhetorical road to travel down, as it usually is trying to guess what’s in people’s hearts when their mouths say otherwise, but it’s also hard to dismiss the anger. Alabama is one of the states where white people resisted desegregation the hardest, so attempts by white conservatives to frame the fight against legal abortion as the new civil rights is offensive in the extreme. Then again, McClurkin is a woman who claimed that an abortion “removes the largest organ in the body.” In the first 12 weeks of pregnancy, when 89 percent of abortions occur, the embryo gets no larger than half an ounce. That makes it about one-sixteenth the size of a woman’s heart, though it is perhaps bigger than a toenail.